Jonathan Golden, Airbnb’s very first product manager and now Director of Product, knows that flexibility can get you far in his line of work. Last year, it even got him to Cuba. While the island nation had always been effectively closed to Airbnb, the reestablishment of diplomatic relations with the U.S. in 2015 opened a door — a door the company’s leaders wanted to walk through quickly. “We thought it was important to incorporate that community into the world and into the Airbnb ecosystem,” says Golden. Any number of Airbnb teams could have added the Cuba project to their existing workload, but given the unique challenges of entering the highly restricted market and managing money transfers, that would have taken too long. So the decision was made to build a new, dedicated team, which landed in the Payments organization that Golden helms. In 10 weeks, a cross-functional team — product managers, designers, engineers, and data scientists reallocated from elsewhere in the org — was assembled. There was extensive support from other areas of the company including legal, operations and comms. It was a herculean task for everyone who worked cross-functionally. But two months later, the initial infrastructure was up and running in Cuba. And almost as quickly as it formed, the team was disbanded, with the ongoing work of maintaining Cuban business doled out to existing product areas. An unusual case? Maybe. But it’s emblematic of the elastic, vision-driven product management approach that has allowed Airbnb to reimagine travel. In this exclusive interview, Golden describes how to build high-impact, modular teams driven by actual needs. He walks through the decision-making framework that he uses to allocate the hottest of commodities: engineers. And he explains why — when everyone is working toward a clear company objective — having teams that expand and contract actually keeps you aligned. If Golden could share just one organizing principle, it would be this: Design your product teams around outcomes, not features. This is where defining a clear vision comes in. Too many teams skip this step because they want to get to the concrete work and not waste their time with touchy-feely goal-setting. When you do this, you end up wasting a lot more time. Your product vision and the team outcomes it spins out aren’t pie-in-the-sky talk reserved for board meetings and investor pitches. It’s as important to your company’s day-to-day functioning as your site metrics or revenue — and like those numbers, you should communicate it clearly and often. That’s not to say that you need to identify a vision that will take your company all the way from series A to IPO. Frankly, you probably couldn’t if you wanted to. Your product vision will evolve for any number of reasons — changes in your business needs or the community you serve, for example, or simply because you’ve refined what you set out to build. The excitement of a consumer technology startup is that the business and environment around you is changing so fast, you must respond in kind. 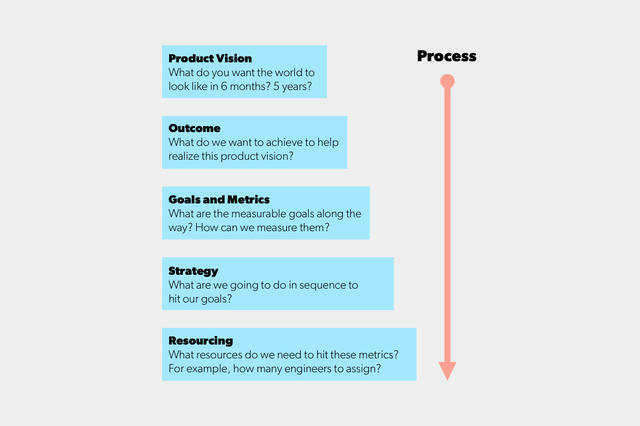 Keep your product vision dynamic, and re-articulate where you’re going on a regular basis. Airbnb optimizes for agility first and foremost by assembling interdisciplinary product teams. The notion of a group of product managers sitting together in a bullpen apart from the rest of the organization is anathema. Instead, product managers are matched with engineers, designers, and data scientists to attack business problems from all sides. If people collaborating on the same project are disjointed or they’re not always interacting, then a lot of the magic of creativity is going to get lost. These are people who are excited by building prototypes, who are pumped about the riskiness of the endeavor and when creating something brand new in the world,” says Golden. Sound a lot like a founder? That’s not a coincidence; founders are typically their companies’ first product person — the ultimate pioneer. But whether you bring it to the table yourself or hire for it, this is the type of PM energy a company needs at the start. How to spot them: These risk-taking front-liners need to be scrappy, so look for someone who has entrepreneurial experience already. That might be someone who was CEO of his or her own company, or even a PM who led an exploratory team for a large company (the lead for a new product area at Google, for example). Don’t, however, assume that any startup experience equals pioneer experience. “There is a huge difference between somebody who has built something and somebody who has maintained something,” says Golden. What is your process for uncovering user needs? How do you know if you’ve achieved product market fit? Tell me a time when you did something non-scalable to jumpstart a product. I’m thinking about building “X” — what do you do to get it built in 10 days? For each of these questions, you’re looking for responses that are both thoughtful and concise. Beware candidates who talk in circles or provide a lot of unnecessary context. They should have a clear sense of what they’d say in each situation and be able to communicate it clearly. And their explanations should dovetail with the cadence, speed and culture of your company. Settlers can come from a variety of backgrounds. Most times they are highly analytical and have an uncanny ability to work hand in hand with data science. Large consumer internet companies have many settlers who work on refining and optimizing product experiences. How to spot them: Look for someone who finds the creativity in A/B testing, someone who’s driven by metrics and can tell you exactly how they’d measure the impact of a new feature. How would you break down our conversion funnel? How do you like to set up an A/B test? We have a feature “X” — what is the use case for the feature and how would you measure it? Tell me about a time you influenced user behavior through product? These are your platform managers, who take over when it’s time to build the infrastructure and systems necessary to handle scale and accommodate your product’s use cases, current and future. Good town planners are also entrepreneurs. Many town planners have technical backgrounds but that is not a hard requirement. They can also work with technical visionaries where the product manager can steer the vision to realize its practicality for the broader product team. At Airbnb, they added product management support to the core infrastructure teams to help them build technical tools to set the business up for scale through the next few years. How to spot them: “Town planners must be able to synthesize large amounts of disparate information to build technology that will service existing and unanticipated use cases,” says Golden. Don’t just look for workhorses who can lay down a solid backend foundation—these PMs also need a vision for the future product initiatives that foundation could support. What metric would you measure to determine success for a platform product? Tell me about a time when you built a system that supported a variety of use cases. How do you balance building toward known cases versus unknown future use cases? How do you know if the platform is too rigid or too flexible? A brand-new enterprise needs to know when to bring on the next wave of product management. But even in an established company, all three types of product managers are critical. “The product team needs each of these PMs to be nimble and responsive. Otherwise the business won’t endure for the long term,” says Golden. “We allocate product resources across three main categories: core initiatives that focus on the existing product, new initiatives that explore possible areas of growth for the business, and platform initiatives that focus on building fundamental technological infrastructure.” Pioneers and settlers don’t become obsolete just because you’re at scale. Done right, the work of these three types of PMs forms a loop that makes the difference between a billion-dollar company and a one-hit wonder. “A product team needs to evolve with the product, how people use the product, and environment around the business,” says Golden. “It needs to have a culture of constant change.” But how do you know when it’s time to effect that change? For that, you’ll need one more building block: A consistent framework for setting and measuring goals. Because without a process for testing hypotheses, you may quickly find that you’re not so much iterating as spinning your wheels. By the time you reach the bottom of this flowchart, resourcing decisions may not be easy, but they’ll be clearer. “Everybody always wants more resources,” says Golden. “For the most part, nobody is saying ‘I’m fine, I don’t need to grow.’ People feel like their work can be contributing to the product, to the community, and in a high-growth company that’s usually true.” Product managers, then, need to work with founders and other company leaders to establish priorities. It’s very much a PM’s role to decide which bets to place. Working through this process chart, though, is not a one-and-done proposition. “You need to constantly revisit and challenge core fundamental assumptions to make sure that you’re making the right decisions based on what we know as factual today,” says Golden. Take Airbnb’s Wish List feature, for example, which was originally conceived as a single-user “favorites” tool. “But most trips on Airbnb have more than one person and once it was in use, we saw that we weren’t actually addressing the real need, which was for sharing favorites and choosing the best place to stay as a group,” says Golden. By the time the tool was relaunched this year, the product vision had been torn down and rebuilt. “We had to take a step back to say, ‘Okay, is this actually what we want the product to be? Does it change our people’s behavior in a positive way?’” Armed with a new product vision, one informed by data, the team reinvented Wish List as a collaborative tool for planning trips (and saw a significant jump in usage). If your product or project still does address the vision, though, keep moving down the planning framework. “At the end of the day, if you realize that a project isn’t succeeding purely because your metric isn’t hitting the goal, normally the culprit is resourcing,” says Golden. And that’s a clear cue to look at re-aligning the team’s resources. “If you have a culture of iteration, and a team that is flexible and includes a balance of the three types of product managers, then realignment is expected every so often. It’s not controversial,” says Golden. Whether you’ve identified a team that’s understaffed, have surfaced new problems that can’t be addressed by existing teams, or want to double down on a nascent opportunity, don’t shy away from moving people where they’ll be most valuable. Take internationalization, for example. Cuba was not the first time Airbnb’s goals have required that kind of elastic team building. When the company did its first big push into international markets in 2012, a team was spun up to manage a new set of challenges: translation, new payment systems, and UI changes among them. And as with Cuba, once those systems and platforms were in place, the tasks of maintaining them were once again distributed across the rest of the organization. It’s clear why a company might want to whip up a product team from scratch, but what about the how? When a product manager is engaged with a given team, how do you sell her on dropping everything to tackle a new challenge? If you’ve established a vision-based company culture, this is where you’ll really reap the rewards. Teams will be bought in to accomplishing a goal, not bringing a particular feature or product to market. “If you’ve done it right from the get-go—articulated your vision, outcome and goals right — it should be much easier to have a conversation about reallocating human resources,” says Golden. Decommissioning a team is often the harder side of this equation, but there too, let your product vision serve as a touchstone. Take the team through your goal-setting framework and identify where things went wrong or changed. Was it a flaw in the product vision, strategy, goal, metrics, or resourcing? “If you go through that process, then the team gets much more comfortable with the reason things didn’t work out as well as they thought,” says Golden. Moreover, in an iterative product management culture, individuals have less to fear. From 2012 to 2013, Golden managed a team that focused on user tools. They handled all guest and host interactions after the booking and tackled many issues around reservation alterations, refunds, and cancellations. But they didn’t have a clear mission that related to an outcome. Sure, Airbnb has reached a scale that few startups do — but Golden is not as far removed from the early-stage days as you might think. “As Airbnb’s product organization expands, each team is actually starting to look like Airbnb did a couple of years ago. Those teams are getting to a size where they’re almost early-stage startup companies on their own,” he says. And like any good startup leader, Golden knows that the key to keeping his teams humming is constant communication. To that end, he hews closely to three simple pillars: process, context, and listening. Process: Having a clear framework for making company decisions, as we’ve seen, is key. Transparently discussing the results of that process is, too. When you do the work of establishing a mission-driven culture, you can afford to be flexible on the details.